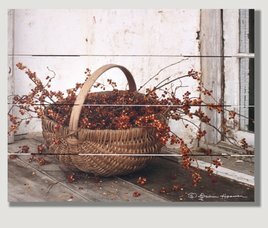 The Old Stone Barn Print brings a touch of our early settlers! Captured by the brush of Primitive Artist Billy Jacobs. Frames are made of poplar wood painted black and assembled. Pick your frame style. Print will be delivered in 10 - 14 days. Billy Jacobs captures the simple elegance of a stone home with Bucks County Homestead Print. Pick the size that best fits your home. Frames are made of poplar wood painted black and assembled. Simply beautiful work! 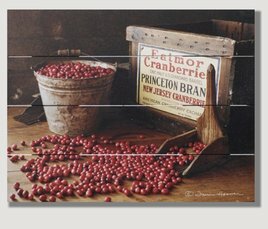 Add a Primitive touch with this Cranberry Bucket Pallet Art! Printed on real wooden slats for a charming, reclaimed look for farmhouse & country style. Measures 9.25-Inches high & 11.75-Inches wide & .75-Inches deep. Made in the USA. 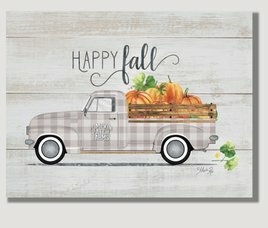 Add a Farmhouse touch with this Hello Fall Vintage Truck Pallet Art! 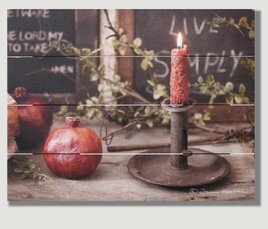 Printed on real wooden slats for a charming, reclaimed look for rustic & country style. Measures 9.25-Inches high & 11.75-Inches wide & .75-Inches deep. Made in the USA. Add a Primitive touch with this Bittersweet Basket Pallet Art! Printed on real wooden slats for a charming, reclaimed look for farmhouse & country style. Measures 9.25-Inches high & 11.75-Inches wide & .75-Inches deep. Made in the USA. Add a Primitive touch with this Live Simply Pallet Art! Printed on real wooden slats for a charming, reclaimed look for farmhouse & country style. Measures 9.25-Inches high & 11.75-Inches wide & .75-Inches deep. Made in the USA.